Friday Musings – Top 3 Must-Have Bike Commuting Accessories? 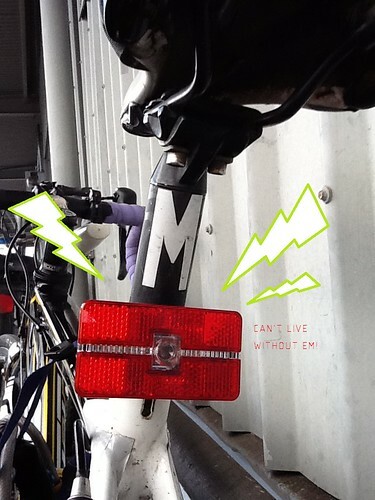 BikeCommuters.com > Reviews > Accessories > Friday Musings – Top 3 Must-Have Bike Commuting Accessories? Well, well, well… the weekend is just around the corner, just in time for FRIDAY MUSINGS! Or… just in time for you to get your Fandango tickets to the Hunger Shames. Before the spring time blooms assault your sinuses with a full-on allergy attack, I wanted to get all sentimental and mushy-gushy over Bike Commuting like the leftover V-day chocos I found in my desk drawer at work. Bike Commuting in Spring - Bring on the Sunshine! RL loves the Whitey Von, but any backpack will do! 1) Any kind of backpack – I used to be all about the rack, but have switched back to the backpack in the past few years! I love backpack. So low-tech, but it WORKS! 2) Watch face taped to my handlebars – So unimpressive and borderline ghetto, this watch is a must for me because it’s easy to read in the morning to determine how much time I have left to get to the office. I taped it to the mount where I used to keep my wireless Cateye from the days of trying to be “fast” – clockin’ 12 mph baby! I love BLINKY LIGHTS more than helmets, pants, or chalupas. 3) Blinky Lights: One rear and one headlight, these are a must for me, I have several kinds around the house and will grab one red and one white everyday. A must-have for me as I am a blinky addict. Enjoy your weekend, bike commuters! 1. Lights – lots of lights. Blinky, solid, colored – gotta have lights. 2. Reflective gear – vest (with blinky lights built in), wrist/ankle straps, tape on frame and saddle bags and helmet. 3. Saddlebags – backpacks are hot, and my saddle bags allow me to carry a change of clothes, breakfast and lunch, and some purse contents. Deodorant is a Must have for any commute. I also bring body wash because I like to have sink baths at the office. Oh and I can’t forget about a small towel. 1) Lights. The brighter the better, and I don’t think you can spend too much on them. Front and rear, and better to have multiples of both. 2) Panniers/saddlebag. I have panniers on two bikes, and a Carradice saddlebag on one. I can carry more with them than a backpack or messenger bag, and it’s much cooler. 3) Fenders. I live in an area which gets lots of rain, and riding home with no fenders means a mouthful of liquefying roadkill. @Emika – Word on the helmet. Let’s count that with the bike. @Mike – Yes only three! Like if the Mayan Calendar ends and you only have time to grab three awesome bike accessories. The blinkys (I cant get enough of)and lights and helmet are all truly must haves but if helmets are counted with the bike maybe the lights should be too? Can we better define “must have”? As a “comfort thing” or “required for safety” category? And assuming current season riding conditions would be nice too. 1. Puncture resistant tires. My commute got hugely better after getting some Conti Gatorskins. And they retain air insanely great. Just have to top off once a week. 2. 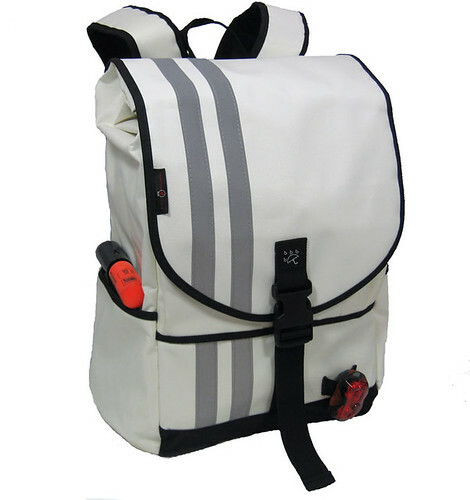 Easy on, easy off pannier: Toto by Detour. Cheap, simple, useful. Just big enough to hold my clothes and toiletries for work. 3. 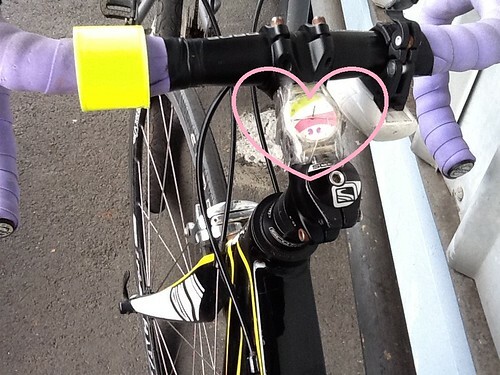 Helmet light. LightNMotion 360. A real necessity for my pre-dawn commute. My one piece of gear that motorists and other cyclists stop and ask me about. @Scott – puncture resistant tires, good one! I’ve never tried any before. Sunglasses, water and good tires. By the way, Mir — drop the ghetto watch face and get one of these: http://www.stemcaptain.com/ Or maybe we’ll hook you up for Christmas if you’re a good girl. I’ve got so many cargo options going on right now I wouldn’t want to narrow it down as everyone is different. I often regret not getting fenders sooner, as they’ve really enhanced my capabilities, but I did without for many years with few real ill effects. 1. My Vaude Egger Computer Pannier; it’s a pannier, no, it’s a briefcase, no, no, IT’S TWO BAGS IN ONE! Switching to bike commuting mode just got ridiculously easy: I just unzip the cover on the back of my “briefcase,” clip the locking, quick-release hooks onto the the rear wheel rack … and the car stays parked! 2. Water. In the summer in Phoenix, I carry three, ice cube filled 24oz bottles on my 16 mile round trip commute. 3. My helmet mounted rear-view mirror; even though I’ve modified my route to get off the busier roadways, I’ve still seen enough Horror Shows coming up behind me — and taken evasive action — to make me believe my mirror has saved my life. How about I talk about three things I will hide in my backpack when I ride my bike to the Hunger Shames this weekend? Dare I say, the ride of SHAME? 3) coffee (if it’s a matinee), wine (if I catch the late show). Hmm, that’s all food/beverage. PRIORITIZIN! @ghost rider the whip – i like my ghetto watch face! but the STEM CAPTAIN looks pro! @keebies…. chocos and coffee! how bout a tuna melt? meet me at the MALLL! It’s goin’ DOWN! 1. helmet, i feel weird and paranoid not wearing one. 2. handtowel to dry off sweat. 3. bungees (i’m surprised no one listed this, but i guess most people don’t have a rack). some of the my other must-haves have already been named (mirror, fenders, and bag/backpack). I usually try to wear a natty hat of some sort as well.